A recent entrant to the wine shop choices on the West Shore of Lake Tahoe is Obexer’s General Store in Homewood, where wine buyer Scott Willers is stocking a great selection of recognizable, unique and affordable wines. By next summer, the shop will be hosting of wine tasting events. Let the fun begin! 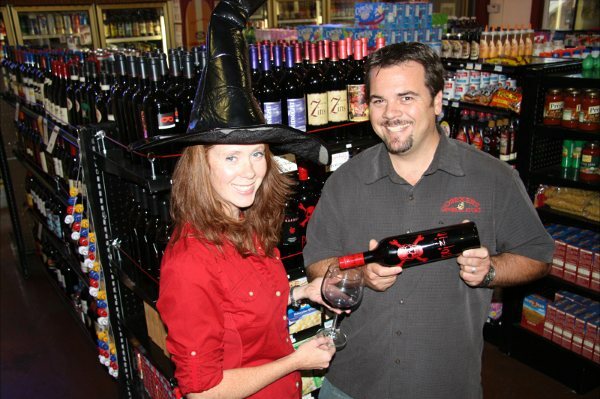 For fun in October, Obexer’s has stocked wines that are perfect choices for Halloween parties. They are all fun, affordable and very drinkable. Evil Cabernet Sauvignon, a label of R Wines company, is 100% cabernet sourced from vineyards in Langhorne Creek, Riverland, Barossa Valley. Over 25% of these grapes are aged in French oak for 12 months, resulting in a wine that is a dark red with bright crimson hues. Aroma is fresh yet rich, with hints of black olive, fresh blackberries and raspberries. Taste is nice and complex with fruit and oak both showing through, and some blackcurrant and spicy clove notes, and a fine tannin finish. 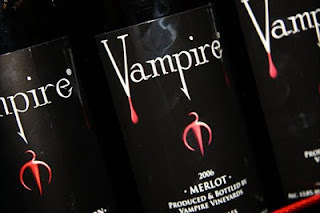 One wine blogger noted that the fun of the label is “"Evil" spelled backwards is "Live" but "Evil" turned upside down, "It's just wrong". That's what the label says anyway….”14.7% alcohol. $9.99 thebottle. 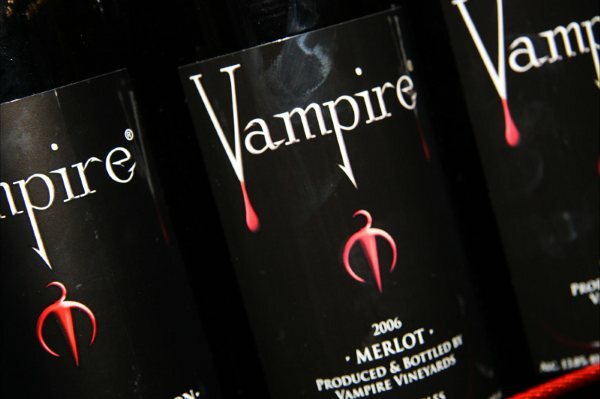 If you are in the mood for merlot, try the Vampire Merlot, which actually hails from Paso Robles, not Romania. (Sorry to disappoint you). This merlot is blended with 8% Cabernet Sauvignon for some additional depth and structure, and 8% Zinfandel to add a bit of spiciness. The result is a nice plumy bouquet, a dark purple color (keep WineAway on hand for spills!) and a nice soft tannin with vanilla hint from aging in American oak. It is enjoyable now, but has enough structure to age for several years. 13.8 % alcohol. $12.99 the bottle. 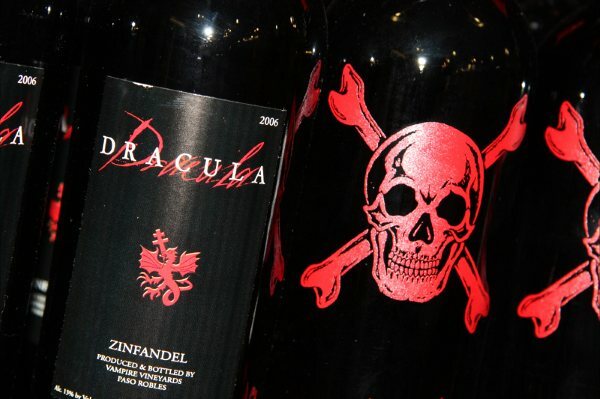 Or try a bottle of Dracula Zinfandel, a big and expressive Zinfandel, also from Paso Robles. The wine has full and deep plum flavors, which are a tantalizing lead up to a taste of pepper and other spices. There’s a great refined texture, and on the palate, nice elegance with polished tannins to finish. 13% alcohol. $19.99 the bottle. You can name your own poison with Poizon Zinfandel, which the winery terms “a wine to die for.” I might not go that far, but it is delicious. This is a Sonoma Dry Creek blend that features almost 80% zin. Aroma of plum, cherries and a hint of green herbs. Nice and velvety, maybe some reminiscence of mocha and buttery cake, and then a nice touch of toastiness from French oak. A mouth watering finish! 15% alcohol, $24.99 the bottle. Want to slink away from the Halloween festivities to trick or treat? Then you’ll want some Incognito Viognier, a white Rhone wine that’s now grown in a Michael David vineyard on a Lodi Delta island located 25 feet below sea level! Unmask long enough to share this yummy wine with friends: its honeysuckle and jasmine aromas practically jump out of your glass. A great rich mouth-feel, flavors of pineapple, apricot and tropical fruit. 16% alcohol, $14.99 the bottle. Obexer’s General Store is located at 5300 W Lake Blvd, Homewood, CA 96141. Phone (530) 525-6297 Open all year around. For more information on dining and the wide range of activities around Lake Tahoe, see the online version of The Tahoe Weekly. This article appeared in my column "It's Grape" in October 2010. ABOUT ME: I've been a journalist since I was 15. 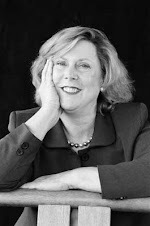 Originally a farm girl from Indiana, I've worked as an Extension Specialist for the USDA, did international market development for a Fortune 500 packaging company, and founded/ran a midsize marketing consulting business. Got an MBA from Harvard in marketing and agribusiness, 1976. You can take the girl off the farm... so I'm back in the agbiz of wine.